Packing luggage is no rocket science. Still many people dread packing for a trip. Usually it is because they are not sure what to pack or how best to pack it. Packing therefore takes them too long time and can be frustrating, even stressful, experience. B for Bag travel packing tips offer practical packing advice. Our aim is to make vacation packing easy and fun. We want to take the stress out of packing. The first step is to decide what to pack for your trip. This depends mainly on where you are going, when (season) and for how long. We follow one simple rule when we pack a suitcase. We start with the items we know we need for the trip (must have). If there is any space left, we fill it with items that would be nice to have with us. We chose carefully the items we pack. We always ask ourselves is this item necessary or will it enhance our travel experience in any way, i.e. could make our trip more comfortable or enjoyable. When you have decided what to pack it is time to start packing. How to pack is all about using limited space wisely. There are number of ways to pack a suitcase and we explain the main packing methods in detail (with photos). Packing list travel templates can be very useful as they reduce the risk of forgetting anything. Using packing checklist can save valuable time and take the stress out of packing. Packing organizers can help you to stay organized when packing, as well as when travelling. That's not all, travel organizers allow you to fit more into your bag... which always a bonus. We agree with the reviewer that said "Packing cubes are like an iPad, do I really need them? No. Can I live without them? Not anymore”. There are also packing luggage accessories available that can help make packing easier. Every traveler needs well-organized toiletry bag and special travel bottles. There are compression bags that can shrink bulky items down to proportion of their size. You can get special packing covers for your gadgets and gear, e.g. electronics and sports gear. Your bag may be packed but you are not done. 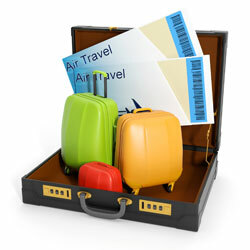 You must lock and label your bag and make sure you have not exceeded your luggage allowance. There are useful luggage accessories available that help you to secure your bag, i.e. locks, labels, straps, etc. We prefer TSA luggage locks after having our bag destroyed by airline security staff. We always use luggage scale to make sure we do not exceed our airlines luggage weight limits. Remember, packing luggage is all about making the most of the limited space available, to fill all space as efficiently as possible. It is as simple as that.